Energy is an important factor in the U.S. and throughout the world. A heightened awareness of where our energy comes from and how we use it helps us to better manage this resource. To improve our understanding of these issues, we need to continue educating ourselves about energy and energy efficiency. Toward that end, EnergyWright, Inc. develops educational products for school and college classrooms, science education centers, and energy training centers. Our products are also used in Building Performance Institute (BPI) certified training programs to educate building contractors, energy auditors, and weatherization crews. Feel free to contact us with ideas for energy education tools you'd like to see us offer. We are continuing to expand our product line and are working towards providing a complete energy education curriculum. 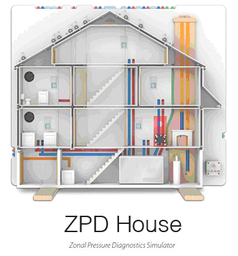 The ZPD House™ is a pressure diagnostic training tool for the weatherization and home contractor industry.